It’s six months later and I’ve finally gotten past issue #1 of X-Sanction. This Loeb and McGuinness pretty much sets up the whole Avengers vs. X-Men crossover this summer in a quick manner. The whole point of X-Sanction was to set up a rift between the two camps. Cable is protecting his adopted daughter Hope–the last mutant and the future savior of mutantkind–from the Avengers. And by protecting her, I mean killing the Avengers. Cable is under the assumption that they will kill his daughter and he won’t allow that. 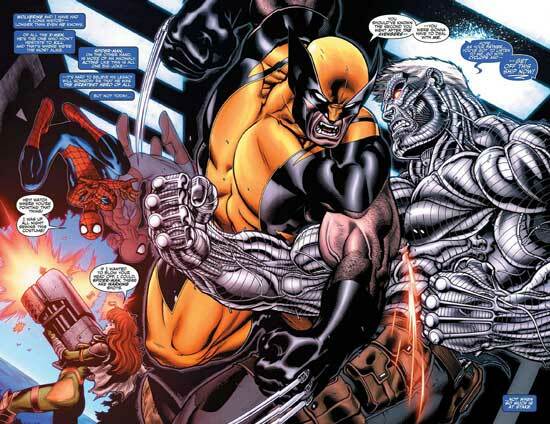 Loeb uses a series of flashbacks to the future where Cable finds out that the Avengers wind up possessing several weapons designed to kill mutants. Because the Avengers are awesome, Cable is nearly dead thanks to being physically beaten and the techno-organic virus wreaking havoc on his body. Hope–now controlling the Phoenix force–is able to not only save her adopted father, but completely remove the techno-organic virus, something that has not been accomplished in the disease’s twenty plus year history. What it also accomplishes is a huge distrust between Captain America and Cyclops, which again makes this a starting point for Avengers vs. X-Men. So should you read this? I’m going to say its you can pass it. Don’t get me wrong, it all made sense story wise and McGuinness’ art is always great. But at the same time, this is just a feeder story for another crossover.You can skip this and start straight at Avengers vs. X-Men #1 without losing anything. This entry was posted in Uncategorized and tagged avengers, avengers vs. x-men, cable, captain america, comics, hope summers, narvel, phoenix force, x-men, x-sanction by Chris. Bookmark the permalink.